I never really understood Snapchat, mostly because of the confusing UI that relies on swiping and clicking on things that don’t look like buttons. 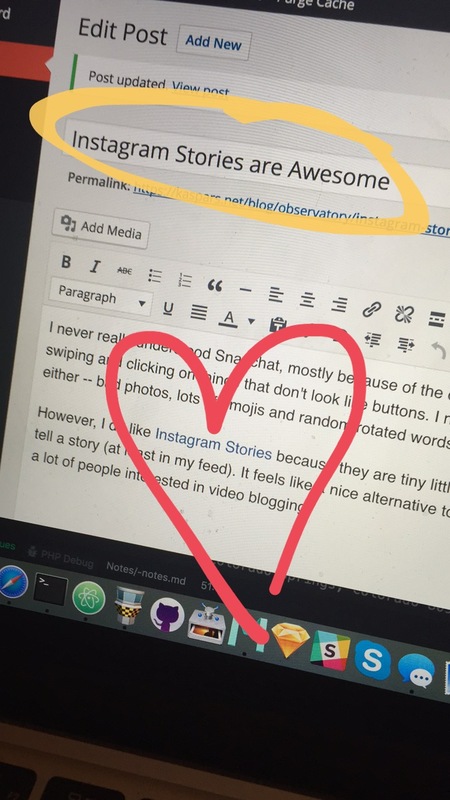 I never liked the style of snaps either — bad photos, lots of emojis and random rotated words. I’m old, right? However, I do like Instagram Stories because they are tiny little sequences of videos that tell a story (at least in my feed). It feels like a nice alternative to Beme and will probably get a lot of people interested in video blogging. I’m having trouble trying to grok Snapchat too. It seems very pointless to me.